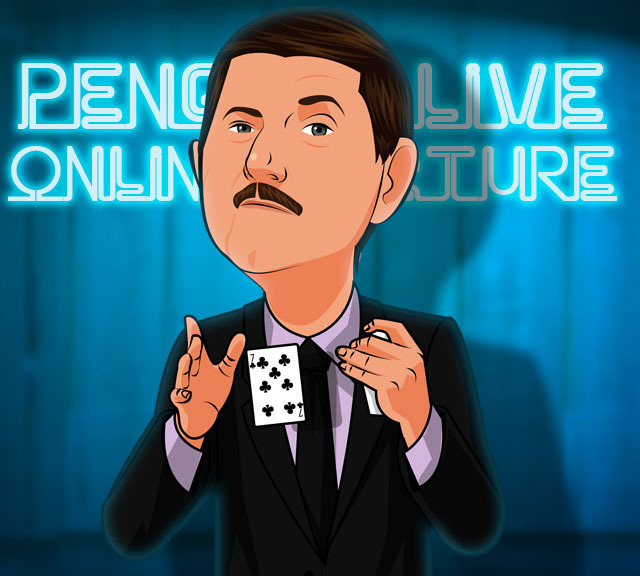 Today, when you order "Tom Burgoon LIVE", you'll instantly be emailed a Penguin Magic gift certificate. You can spend it on anything you like at Penguin, just like cash. Just complete your order as normal, and within seconds you'll get an email with your gift certificate. Tom Burgoon LIVE (Penguin LIVE) Tom Burgoon's one-of-a-kind style is in high demand! Don't miss this hilarious and power-packed lecture! SUPPORT LIVE MAGIC. DOWNLOAD THE FULL LECTURE TODAY. Ever messed up a trick? With one auspicious and magical turn of the rotary dial, there appeared Mr. Sunday Night himself – Ed Sullivan – boasting a variety hour lineup of singers, dancers, puppeteers, acrobats, and celebrities and as fate would offer... a magician. For a captive and curious five-year old Tom Burgoon, this would be his premier introduction to the world of magic and entertainment and the rest – as they say – is truly history. With an entrepreneurial career that spans over four decades, Tom Burgoon has wowed and impressed audiences coast to coast both on land and sea. His unique brand of comedy and magic has been showcased to a vast audience, with venues including everything from cruise lines to corporate clients such as 3M, Coca Cola and NASA. From comedy clubs and stage events in Las Vegas, Reno and L.A. to performing for President George W. Bush at the Inaugural Ball in Washington D.C., Tom has branded his unparalleled one-of-a-kind-show across our country and he has become one of the most in demand performers today. As magic is his first love, it is only befitting that you will find him performing at the Magic Castle in Hollywood – a conjurer's delight and layman's mystical dream come true. Tom Burgoon has prolifically shared his unique style of entertainment with thousands and thousands of delighted guests. He finds it a thrill and considers it a privilege and honor to perform and entertain. The quality of his work is echoed in the omnipotent phrase that Mr. Sunday Night himself reserved only for his best entertainers... "It's a really big show." 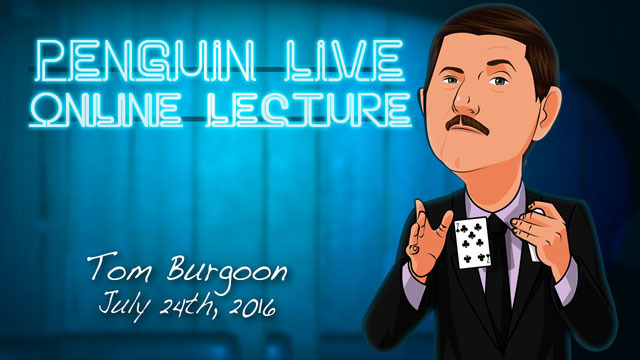 Don't miss Tom Burgoon here at Penguin LIVE! If you've never been to a magic lecture, there's never been a better time. Sunday, July 24th, at 7:00pm, we're streaming Tom Burgoon LIVE in a spectacular 2-hour interactive online lecture. Watch and learn things you won't find in any book or DVD. Purchase the Tom Burgoon LIVE product. This is your ticket. 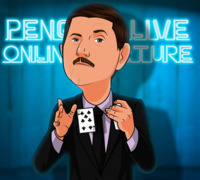 On Sunday, July 24th, anytime before 7:00pm Eastern, click the MyPenguinMagic area at the top of the Penguin site. You'll see the stream appear 1 hour before showtime. At 7pm sharp, Tom will hit the stage and begin his JAM-PACKED professional lecture. This was a good lecture, but I felt that something was missing. There are some cool bits of business, but the real lessons come from watching someone like Tom work an audience and you don't really get to see that. When I heard about the new way Penguin were doing these lectures with the live performance followed by the lecture I assumed you'd get to see that full performance. But you don't. There are two moments where they cut to a section of the live performance. These were the highlights for me. Anyone expecting to see Tom's toilet paper trick will be disappointed. Even though you get a glimpse of it in the trailer you don't get to see it, which is a shame. I'd love to see Tom perform it. I know the routine is nearly 0. But to hint at it in the trailer and then not even mention it was a bit off. Not Tom's fault. Totally Penguin. If the full show was made available I'd have given this more. But as I said, I feel that by not showing it something was missing and so only 3 stars from me. Knowing you don't get to see the full show also puts me off looking at other lectures in the future. Very entertaining for gags and little filler pieces.. and of course they are what make a show fun for an audience. 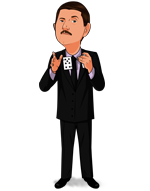 I will definitely use some of his gags and bits..naturally, they are for sale separately.. so think of it as a dealer lecture as most lectures are, but a useful one if you like a little comedy with your magic! My preference is mentalism. Still, if you can't find a trick or two or a comedy bit or two to add to your act, you're not paying attention. Lots of good stuff in here. Highly recommended. I was in the audience for this lecture! Highly recommend getting it if you want to add some humorous bits or gags to your act. Heck it's a fun one to watch even if that's not your performance style! Tom's a good guy and this is a good lecture! I really enjoyed the sight gags and the comedy bits of Tom. Some of these things I'll be using in my shows.Great entertainment. Laughed out loud a lot. Great fun and funny bits and workable routines. Not so much effects, but heaps of the humorous moments and gags that make a show flow. As usual, the advice is good. Definitely good if you think you need a few of those moments to lighten the mood and help transitions. Great Lecture. Funny Guy, great insight and very creative. Excellent lecture by a really cool, Funny guy. Have been doing his spoon routine for years. Alot, of dvd's send me to sleep but this guy i great. It's the first time i have seen Tom perform but i will be on the look out for any other downloads that he releases. I am now a Tom Burgoon fan. I enjoyed this lecture-very professional ! On the 26th July I emailed Penguin to see if they could supply 4 items Tom referred to in his lecture-he said they could be supplied by Penguin but so far I've not had a reply. Would really like to hear.......! ?